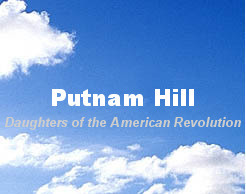 Putnam Hill Chapter is the local chapter of the National Society Daughters of the American Revolution, located in Greenwich, Connecticut. If you are interested in membership, please contact us at PutnamHillDAR@gmail.com. Genealogy research and assistance are available. More information concerning membership is available from the Connecticut DAR at CTDAR and the National Society DAR at NSDAR.